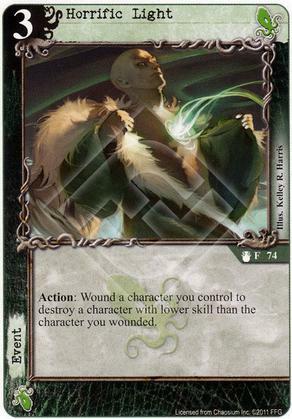 Since the criteria for choosing the destroyed character is skill, my first thought is to pairing Cthulhu with Syndicate. Not only does Syndicate have ample skill, and the ability to reduce others' skill, but they also have toughness both in characters and in Dutch Courage. That Horrific Light destroys, rather than wounds, makes a fine option for dealing with characters impervious to wounding. It's a little expensive for my taste but as you pointed out gets round Invulnerability or Toughness Which makes it fairly useful. 3 is very expensive for the effect. Very situational for getting past invulnerable. Still can't touch Savio with a conspiracy in play. Yeah, the cost is the main detriment. In-faction it works best with 'The Thing from the Shore', which has Skill 5, Toughness +3 and can heal itself by succeeding at stories. Adding Syndicate for some skill reduction and more options for high-skill characters seems like a good idea.